Shell is a global group of energy and petrochemical companies employing 92,000 people in more than 70 countries. Our aim is to help meet the energy needs of society in ways that are economically, environmentally and socially responsible. Upstream International manages the Upstream business outside the Americas. It searches for and recovers crude oil, natural gas and natural gas liquids, liquefies and transports gas, and operates the upstream and midstream infrastructure necessary to deliver oil and gas to market. Its activities are managed primarily by lines of business which are logically combined activities underpinned by strategic themes. Upstream Americas manages the Upstream business in North and South America. It searches for and recovers crude oil, natural gas and natural gas liquids, transports gas and operates the upstream and midstream infrastructure necessary to deliver oil and gas to market. Upstream Americas also extracts bitumen from oil sands that is converted into synthetic crude oil. Its activities are managed primarily by lines of business which are logically combined activities underpinned by strategic themes. The wind power activities in the USA are part of Upstream Americas. Downstream manages the manufacturing, supply, distribution and marketing activities for oil products, biofuels and chemicals. These activities are organised into globally managed classes of business. 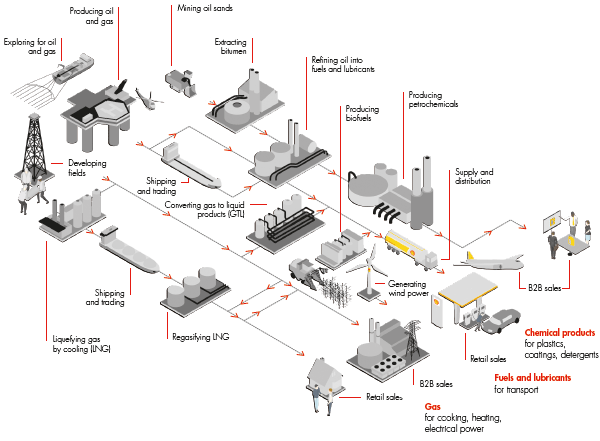 Downstream trades Shell’s flow of hydrocarbons and other energy-related products. It also oversees Shell’s interests in alternative energy, excluding wind. Projects and Technology is overall accountable for wells engineering and wells completion, for project engineering and project execution. It drives the research and innovation to create technology solutions. It provides technical services and technology capability covering both upstream and downstream activities. It is responsible for providing functional leadership across Shell in the areas of safety, environment and social performance as well as contracting and procurement.